Module-records blog about electronic music: Does Propellerhead Software refer to Kubrick's movie ? Does Propellerhead Software refer to Kubrick's movie ? 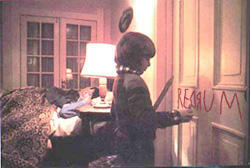 Does Propellerhead Software refer to the famous Kubrick's movie "The shining" with their ReDrum rack for Reason ? With absolutely no authority, I say... Yes! Yes, of course I agreee with you. it occurred to me a while back too... NN-19 should be obvious, tho. Excuse me, but can you explain that ?